Songwriting is a wide and varied art form that takes on many different personalities depending upon the writer and the subject matter. Drew Kennedy is one of the best songwriters on the planet and has been for some time. He’s good because he’s honest, even when making the story up about something from the ether of his imagination, a high school anecdote or a gig routing trip through the vastness of west Texas. He writes what he knows and he knows more than most. Kennedy is an intelligent, observant philosopher on the human condition. He’s able to consider the many angles and trails that lead us down the paths we travel each day. Even when he writes about things he has no clue about, he makes you believe it…and that’s the beauty. You fall into the wondrous rush of his words and melodies until you yourself end up in that desolate, descriptive place Kennedy has created. It’s transcendent work on the level of Clark, Van Zandt and Keen. Over the course of his career, the Pennsylvanian turned Texan has grown with each album. A constant creative visionary in a land of guys trying to sound like someone else. Kennedy has embraced his off-kilter singing voice and knack for storytelling to create a canon of work as good as any hero you can name. 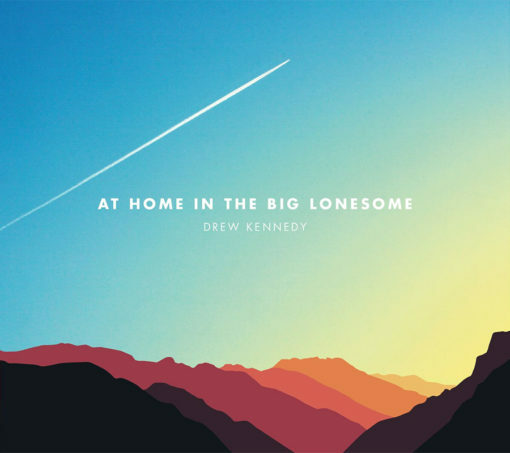 When it came time to record this latest project, At Home in the Big Lonesome, Kennedy sought to make the type of record he himself would enjoy listening to in the car as opposed to catering to radio, expectations or trying to fit songs into a vacuum. He went where his ears, brain and soul took him and brought producer Dave Brainard along for the adventure. The results are spectacular Americana-folk-country-pop jaunts through space, time and existence. This is thinking person’s music. As Kennedy himself said, “If you’re looking for songs about a bonfire party in a field or hell-raising anthems to crack a Natty Light to, well, you’ll be disappointed. Don’t get me wrong… I’ve done all of those things. I’m just not doing them now.” What he is doing now is making fantastic American music. The Sean McConnell co-write “24 Hours in New York City” was a late addition to the project and we should all be thankful it made the cut as it is a monster song. The story of young lovers traversing the Big Apple on borrowed time and credit is a splendid, nostalgic snapshot of youth. “House” flips the script on making a house into a home in a heartbreakingly honest way. “Cream and Sugar”, long a live favorite has found its home here as a Bruce Hornsby simmer, behind closed doors reality. “Open Road” is the type of easygoing foot on pedal, hand on wheel, windows down anthem we don’t hear enough of. It encapsulates the version of freedom we enjoy that showcases good tunes on the radio and a blur of landscapes beside you. Rather than give a full track by track breakdown, I’ll just say that this is Kennedy’s finest work and that is truly saying something. Much like the Turnpike Troubadours who also recently released their best effort, it’s encouraging to see artists continuing to evolve, grow and get better with age instead of resting on laurels. Kennedy is a strong, confident writer and performer that has cobbled together the type of life experiences and wisdom to match his artistic appetite and leave us all satisfied. I thought “Jackson” was very well-written and has a great hook. “Cream and Sugar” was also good. My only critique — and it’s personal preference — would be to put Track 1 as the closing track. Track 11 sort of peters out and I kind of wanted a “off into the sunset” moment, especially given the road-trip nature of the album. Its like you read my mind! You appear to know a lot aboutthis, like you wrote the book in it or something.I think that you can do with some pics to drive themessage home a bit, but instead of that, this is great blog.A great read. I’ll certainly be back.